Here you'll find detailed videos and step-by-step instructions for installation of many of our products. From Seat Covers to Floor Mats, the trickiest part is often installing them into your vehicle. Can't find your product? Send us a suggestion using the chat or messaging tool on the bottom of your screen, or you can always email us at help@customautocrews.com. Some products here may be materially different from yours though the guides are still applicable. Please consult our customer support staff for any necessary clarification. Use the navigation here to jump to your desired product category. Remove your seat’s headrest. This can be done usually by holding down a small button located at the base and pulling the headrest straight up. Place to the side. Slide the top portion of the seat cover over your seat, while gripping the bottom where the seams meet. Make sure the seat covers seams line up with the shape of your seat. Locate the foam bar behind the seat cover and tuck it through the crease of your seat tightly. Pull the seat cover’s bottom piece over your seat’s lower cushion. Slide on the headrest cover and reinstall to the seat. Finally, locate the straps behind your seat. Pull together to attach the Velcro ends, tightening to ensure a snug fit. Begin by laying out the bottom portion of the seat cover over your seat. Even it out and tuck it in as much as possible for the time being. Alignment with the shape of your seat is key in this step. Locate seat belt buckles. 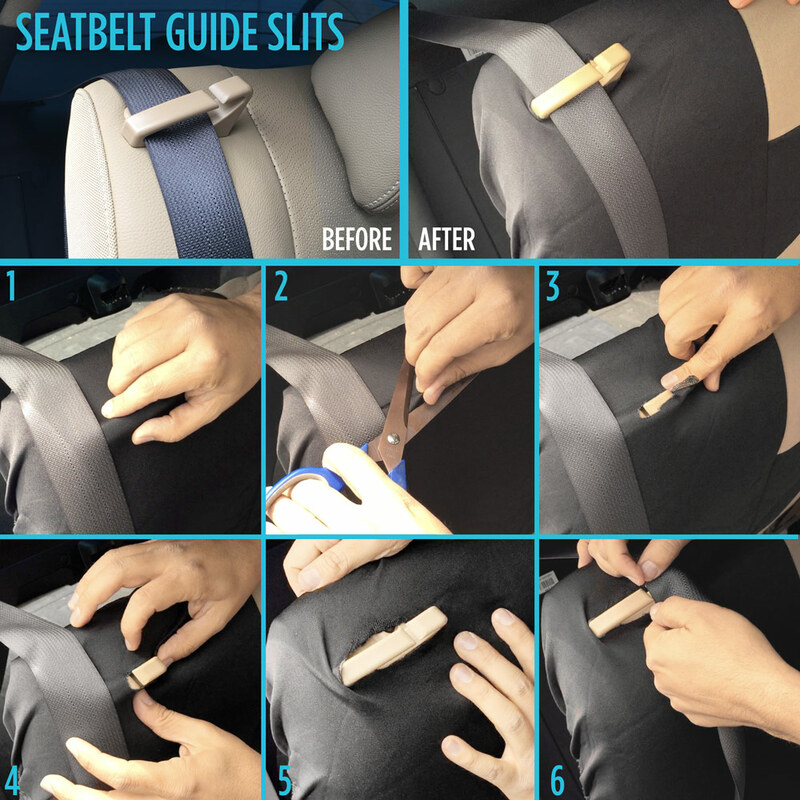 Cut slits into the seat cover to accommodate the seat belts, being careful not to cut too much. Make small cuts, one at a time, for a tight fit. Once finished with your cuts and the seat belts can be pulled out for exposure, tuck the seat cover tightly around them. Remove headrests to install top portion of the seat cover and place to the side. Wrap top portion over your seats, tucking around to ensure alignment with the bottom portion. It is important to make sure alignment is correct before continuing to the next step. Cut small slits into the top portion of the seat cover to accommodate entry of the headrest. Use an exacto knife to cut a slit or pinch the seat cover to gather the material and use scissors to cut a small slit. Again, make small cuts, one at a time if necessary, for a tight, clean fit. Finally, slide headrest covers over your headrests and then insert them back into the seats. Note: Further tucking and accommodations may be necessary. Use the elastic loops and hooks for further tightening. This is a 60/40 split bench cover, so one back cover is larger than the other. Determine where your back seat split will be and locate the two different sized back covers. The smaller back cover is referred to the smaller (40) back seat portion. The bigger one is referred to as the larger (60) back seat portion. The largest portion is the bench cover (the bottom portion). The smallest covers are your headrest covers. Please locate all these sizes before beginning the installation process. Remove headrest and slip the smaller (40) back seat portion over the seat. Make sure the side with mesh goes on top where the headrest goes. This portion is meant to not have any holes for the headrest, you will cut those out later! Once the back seat cover is slipped on, locate the 6 elastic straps. Connect the straps with the clips. The two top elastic straps connect with the two bottom straps, and finally the two sides connect. Pull the bottom cover through ensuring a tight fit. Again, the mesh goes on top. The side without mesh goes tucked between the top seat and the bench. Remove the headrests and slip the cover over the seat and begin pulling and tugging it on. Locate the 10 elastic straps in back. The top three elastic straps connect to the bottom three. The sides connect and the bottom corners connect to the hooks in the middle. Adjust the seat forward and locate the additional 3 elastic straps on the bottom attach them to the hooks already in place. For the bottom cover, the mesh side goes in front. The side without mesh needs to be tucked between the top and bottom crease of the seats. Again, there are no holes, so cover the seat belts. You will be cutting these holes later! Fold seats forward so that you can work underneath the seat. Locate the 6 elastic straps and use the hooks to attach them together. Slip headrest covers over the head rest. Cut small holes for belts and headrests. Remember, start with small cuts. You can always make a cut bigger but you can't make one smaller. Customize your belt location. Again smaller cuts is key here! This Bench Features Integrated (Built-in) Hood Covers for Headrests Attached to the rear bench seat. Open up the rear seat cover and locate the headrest portions. Starting from the headrests, pull seat cover down, aligning both headrests with the cover. Continue pulling the seat cover down over the top corners of the seat and tucking. Once the top portion of the seat cover is secure, begin pushing the bottom portion of the cover between the seats. Tuck in as thoroughly as you can, making sure the elastic straps get tucked all the way through as well. Smooth the cover with your hands as you tuck under. Pull and adjust the cover so that it's covering the rear seat tightly. Now it's time to work from the trunk of the car. Locate the 5 black elastic straps on each side. Locate the metal ring clips and slide the elastic straps in, making sure they are aligned with the adjacent straps. Slide a new ring into the elastic on the side of the seat and attach it to the clip farthest from it. Repeat the steps on the other side. Tuck and pull to ensure a smooth fit. Locate the mesh fabric on the bottom cover. This mesh portion will face the front of the bench. Wrap the cover around the bench, pulling and tugging to adjust. The cover will only fit properly if the mesh portion is facing the front of the bench, so please make sure you are installing it correctly. Connect the elastic straps for the bottom bench portion to the metal clips already installed. Locate the seat belt under the seat cover. Using scissors, cut a small hole to push the seat belt buckle through. Make sure the hole you cut it not too large. Start out with a small hole and make it bigger if necessary. Remember, it is always better to cut a hole too small than a hole too large. Continue this process with the remaining seat belts. The TS-202 Series is Custom-Made for Ford F-Series 2004-2008. Measure up the location of the headrest slot holes using your fingers to feel around. Using an exacto knife or scissors, cut small slits into the cover over the plastic slot holes, just big enough to fit scissor blades through. Keep the slits under a half an inch. Using scissors, cut and “x” mark. Make sure neither slit is longer than 1 inch. Remember to start small, and cut a larger slit if needed. It's better to cut a slit too small than too big. Pull back the opening to form around the headrest slot plastic using the tips of your fingers. Continue with the remaining headrest slot holes. Insert headrest into the slot holes. Take the steering wheel cover and hold it up to your steering wheel, noticing where the top, bottom, and sides of the cover are located. With some steering wheel covers, there will be stitching located at the bottom. Now, align the bottom of the cover with the bottom of your steering wheel and press it over, wrapping it around the bottom portion of the wheel. *Before installing, use a blow dryer on high heat to soften the leather. This will make it easier to stretch it around your steering wheel. *Make sure fingernails are trimmed short. You will need a good grip the wrap the cover around your steering wheel. Place cushion on seat as you would use it. Lift the headrest so there is space between the headrest and seat. Slip the top portion of the cushion through the space under the headrest, pulling it through until the cushion is fitting your seat properly with the pads of the cushion lined up against the seat. Now face the back of the seat. Locate the two elastic straps hanging from the ends of the portion you just slipped under the headrest. Take a plastic hook that came with your new seat cushion and slip one end through one of the elastic straps halfway and tie a knot. This will keep the plastic hook in place. Repeat this with the other elastic strap next to it. Locate the two elastic loops from the space between the back of the seat and the bottom. Pull them through so they are visible. Pull one of the plastic hooks you just installed straight down until it stretches to the bottom of the seat. Take one of the bottom elastic loops and slip it through the plastic hook. Repeat this with the other elastic loop. Adjust the headrest back to your desired height. Before installing a new hubcap to your wheel, it is important you have the correct size cover. Locate the numbers and letters on your wheel. For example, you may see something like 215/65R16. Usually after the letter “R” is the size of your wheel. So in the above example, this wheel size is 16. To begin, you will need a pair of gloves and a flathead screwdriver to remove the old hubcap. Put on the gloves and pry around the rim of the old hubcap with the flathead screwdriver to loosen it. Remove the hubcap by pulling it off. Now take your new hubcap and notice if the retention ring is not attached. To attach it, simply find the bent portion of the ring and align it to the “u” shape slot in the cover (called the valve stem opening). Attach the ring into the grooves all the way around the cover, making sure the bent portion of the ring is aligned with the valve stem opening. Hold the new hubcap parallel to the rim, aligning the valve stem opening with the valve stem, but make sure it's not touching yet. Make sure to apply even pressure when installing wheel covers. Your best chance at getting a wheel cover on is to imagine putting a bottle cap back on a bottle. If you try any other method you have a 50/50 chance it could break. It is suggested that you use your hands near the top and knees near the bottom and apply pressure evenly. Go all the way around until you are finished snapping it into place. Use simultaneous pressure to 2 sections at a time. For example, after snapping in the 3-o'clock, 9-o'clock, 12-o'clock, and 6-o'clock positions, move to the 10-o'clock and 2-o'clock position, followed by the 4-o'clock and 8-o'clock position. Try to keep the wheel cover as close to parallel as possible throughout this process. Tug on it to ensure a tight fit. Repeat these steps for the remaining three wheels. When opening the box to the new hubcap, be careful not to damage or tear it. This way, you can return or exchange it for a different size. If you fail to secure the hubcap correctly, you may lose the new hubcap while you are driving. Make sure to tug on it after installing to make sure it is not loose. Notice the loops located at the ends of the cable. Start with the end with the smaller sized loop and insert it through the hole in the car cover. Slip the cable through just a little, about a foot in length. Grab the other end of the cable (the side with the larger-sized loop) and insert the small end through. Pull all the way through until it is securely wrapped around. Toss the cable under the vehicle towards the other side so that you can secure the other end of the cover. Go to the other side of the vehicle and locate the end of the cable from underneath. Slip just the end of the cable through the hole in the car cover, going from the inside to the outside of the cover. This will make attaching the lock easier. Slowly let go of the cable, making sure it is staying in place. Locate the lock and key (it’s easier if the key is already inside the lock). Slip the lock through the small loop at the end of the cable and grab the cable from underneath the vehicle. Pull it towards you and secure it with the lock. Your car cover is now safe and secure! Make sure to keep your key in a safe place!